A group of 4x4 enthusiasts in Herefordshire are transporting medical staff around the county after further snowfall. Volunteer drivers from Herefordshire 4x4 Response Group help out when conditions become dangerous or impassable for other vehicles. Charlie Bennett, the team controller who co-ordinates all the call-outs, said: "Since the worst snow came down we have been doing between 10 and 20 jobs a day." Herefordshire Council said the north of the county had been hit by heavy snow and that gritters and ploughs were working to keep main roads open. Mr Bennett, of Titley, near Kington, said there had been at least 4in (10cm) of snowfall in the area overnight and more during the day. Neighbouring Worcestershire also saw heavy snow, with some areas seeing more than 1ft (30cm) of snowfall. 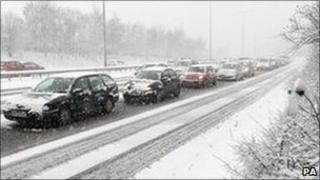 Snowfall meant the main carriageway on the M5 northbound was blocked for a time between junction 5 and junction 4A. A number of lorries had jack-knifed, causing further problems. One mother-to-be in Hanley Swan, Worcester, said she had been hoping to have a home birth but had to change her plans, mainly as a result of the snow. The woman, who did not want to be named, said her midwife had been unable to come and visit her home and she had now been advised to go to hospital. "I'm getting a lift in a Land Rover. It's not as bad as country places, but the roads are quite treacherous," she said. Bromsgrove was one of the worst places affected. Some train services were not stopping at the town's station because of the severe conditions. One train conductor told the BBC it was the worst conditions he had known, with commuters waiting in 4 to 5in of snow on platforms. Meanwhile, in Herefordshire, the response team were being contacted by charities or the council's emergency planners. Mr Bennett said: "Our main job has been taking nurses and doctors to hospitals, so the hospitals can function. "We are also on standby for West Midlands Ambulance Service." Mr Bennett added: "There are 10 jobs we are doing today and this is mainly getting nurses home from hospital and taking district nurses on their rounds. "We do cover some very remote places." Mr Bennett said the drivers were often out for six or seven hours on the district nurse rounds and were "well stocked with tea and coffee". The response group, which operates during adverse conditions during about two months of the year, is made up of about 30 volunteer drivers who have their fuel costs refunded when working for local authorities. Mr Bennett, a mechanic at Portland Garage in Weobly, said the majority of members worked full-time and their employers allowed them time off to carry out the response work. All drivers are equipped with mobile telephones and Citizen Band (CB) radios, enabling contact to be maintained between the vehicles and the incident controller. Members of a Land Rovers' club formed the team during the flooding which severely affected parts of England in the summer of 2007. The group was recognised for its courage in the Pride of Herefordshire Awards 2007 for its role in helping communities affected by flooding.